Take 1 softgel up to two times daily with a meal or a glass of water. Refrigerate after opening. Omega-3 Fatty Acids May Help Maintain A Healthy Heart! 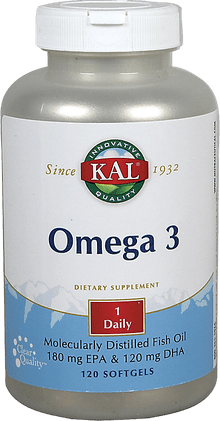 Omega-3 is the general name given to the family of polyunsaturated essential fatty acids (EFAs). 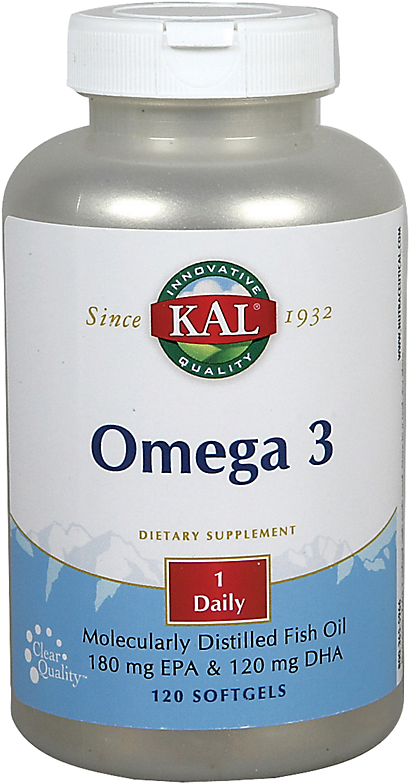 Essential fatty acids can be grouped into two categories, omega-6 EFAs and the omega-3 EFAs. Omega-6 acids promote inflammation, blood clotting, and tumor growth, while omega-3 acids, including Eicosapentaenoic Acid (EPA) and Docosahexaenoic Acid (DPA) serve a very different, yet vital, function for the body. Nutritionists and medical professionals alike have come to recognize the importance of balancing omega-3 fatty acids with omega-6 fatty acids in the human diet. Key omega-3 fatty acids including EPA and DHA are found primarily in oily cold-water fish such as tuna, salmon, and mackerel (higher concentrations are found in pure fish oil). Aside from fresh seaweed, a staple of many oriental cultures, plant foods rarely contain EPA or DHA. And because most people on a typical Western diet consume far more omega-6-rich foods (including cereals, whole-grain bread, baked goods, fried foods, margarine, and others), the ratio of Omega-6 to Omega-3 fatty acids is out of balance for just about everyone. What does this mean? This means for most Americans the emphasis should to be on increasing omega-3s to make the ratio more even and to put the body back in balance. Theoretically, humans should be able to synthesize Omega-3 EPA and DHA from dietary Omega-3 ALA (Alpha-linolenic Acid - found primarily in dark green vegetables), but in practice this process is inefficient. Many medical researchers have therefore concluded that omega-3 EPA and DHA should be obtained by dietary supplement. High quality fish oil is one of the rare sources that contain substantial concentrations of both EPA and DHA omega-3 fatty acids. Omega-3 fatty acids can be found naturally in fish, flaxseed, canola oil, nuts, and avocados. They are also available in some fortified eggs and dairy products.